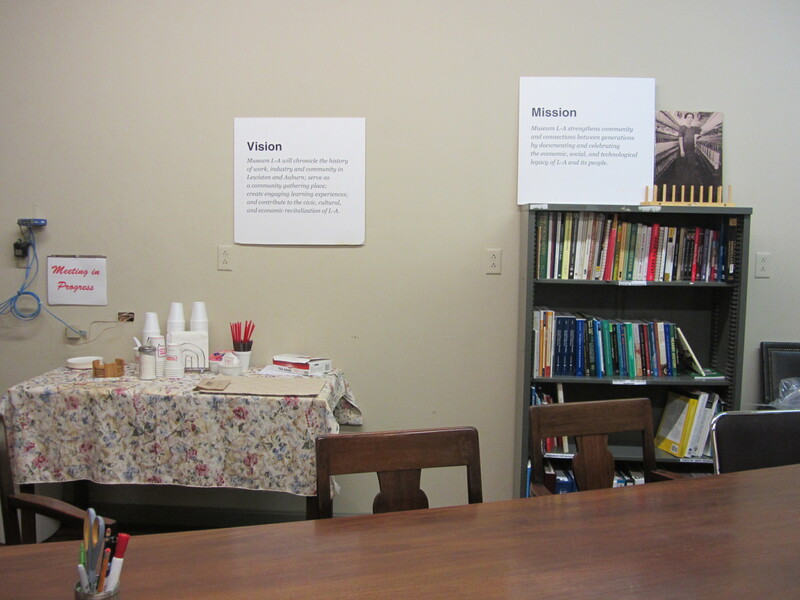 A recent visit to Museum L-A in Maine, a local history museum serving the communities of Lewiston and Auburn, revealed a clever way to keep the mission and vision visible and prominent. They were posted on large boards in the conference room above the refreshments–whenever a group met, they couldn’t miss these reminders of the organization’s purpose and direction. Museum L-A strengthens community and connections between generations by documenting and celebrating the economic, social, and technological legacy of L-A and its people. Museum L-A chronicles the history of work, industry and community in Lewiston and Auburn; serves as a community gathering place; creates engaging learning experiences; and contributes to the civic, cultural, and economic revitalization of L-A. For more details, see their strategic plan highlights on their website. I was pretty impressed with this local history museum, so you’ll find a post or two about it in the future. This entry was posted in Community engagement, Governance and management and tagged Mission statements, Museum Lewiston-Auburn, Vision statements on August 1, 2012 by Max van Balgooy. I have always (always) loved this idea. An extension I’ve seen is to post it in public places at the institution, so that members/visitors know not only the mission but also how seriously the staff/board takes that mission. Great idea, Bob! I’ve also seen mission statements printed on the back of business cards (but it’s got to be short and sweet to be legible! ).